Development of Original Technology for the Fabrication of Antibacterial Film Removing E-coli in Water with 100% Efficiency. An effective way to tailor the physicochemical properties of graphene film is developed by combining colloidal suspensions of reduced graphene oxide (rG-O) nanosheets and exfoliated layered titanate nanosheets for the fabrication of freestanding hybrid films comprised of stacked and overlapped nanosheets. The rG-O is a monolayer of hexagonal carbon array well-known as novel advanced material with the highest electron conductivity and the toughest mechanical strength. The layered titanium oxide nanosheet, another component in the hybrid film, is two-dimensional inorganic nanosheet composed of titanium and oxygen atoms. A flow-directed filtration of such mixed colloidal suspensions yields freestanding hybrid films comprised of strongly-coupled rG-O and titanate nanosheets with tunable chemical composition. This work of prof. S. -J. Hwang et al. is the first example of highly flexible hybrid films composed of graphene and metal oxide nanosheets. The intimate incorporation of layered titanate nanosheets into the graphene film gives rise not only to an increase of mechanical strength but also to increased surface roughness, chemical stability, and hydrophilicity; thus, the physicochemical properties of the graphene film can be tuned by hybridization with inorganic nanosheets. Of prime importance is that the freestanding hybrid films of rG-O-layered titanate show unprecedentedly high antibacterial property, resulting in the complete sterilization of Escherichia coli O157:H7 in a very short period of 15 min. The antibacterial activity of the hybrid film is far superior to that of pure graphene film showing 85% sterilization efficacy in 60 min. To the best of our knowledge, the present hybrid film possesses the highest antibacterial efficacy in the world. Prof. S. -J. Hwang et al. 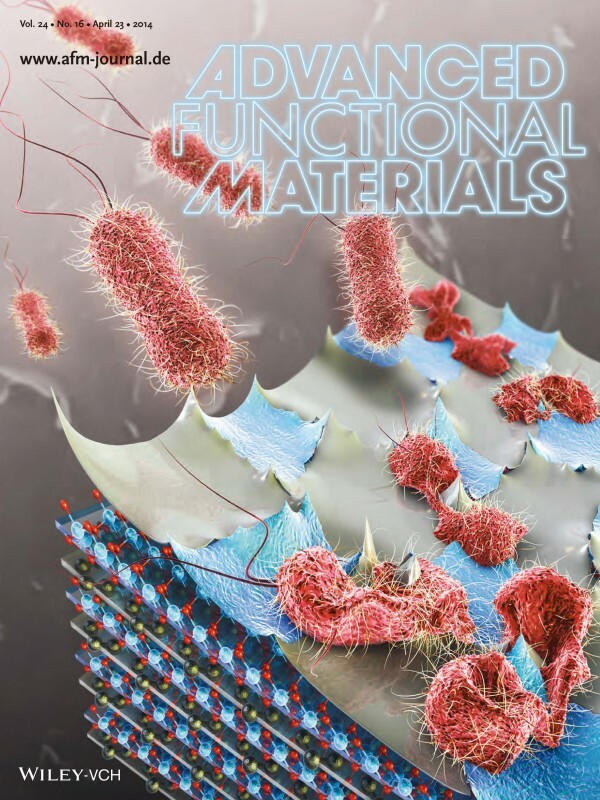 demonstrate that the remarkable improvement of the antibacterial activity of rG-O films upon the incorporation of layered titanate nanosheets is due to the increase of bacteria membrane stress via enhanced physical damage of the bacteria. Taking into account the high flexibility and good mechanical strength of present freestanding hybrid films, these films can be used as an efficient antibacterial matrix. Considering the fact that most of the broad class of exfoliated metal oxide nanosheets can be readily mixed with the rG-O nanosheets, this outstanding report by prof. S. -J. Hwang et al provides a powerful way to fabricate novel graphene-based hybrid films with thus a broad range of functionality. In fact, the universal applicability of the present synthetic method is demonstrated by the fabrication of rG-O-MnO2 freestanding hybrid film via the same filtration process of colloidal mixtures of rG-O and layered MnO2 nanosheets in their report. NOTE: This work has been selected as a cover paper in the issue of Advanced Functional Materials. Figure. Strongly-Coupled Freestanding Hybrid Film of Graphene and Layered Titanate Nanosheets with High Antibacterial Activity. Strongly-Coupled Freestanding Hybrid Films of Graphene and Layered Titanate Nanosheets: An Effective Way to Tailor the Physicochemical and Antibacterial Properties of Graphene Film,.